Early detection: two words that can mean the difference between life and death. The media do well to remind us of this, frequently pestering us to check ourselves for suspicious lumps and bumps. In hospitals, patients are offered more advanced tests in the hope that the emergence of an early stage cancer will trigger alarm bells, potentially allowing doctors to cure the disease and significantly improve patient outcomes. 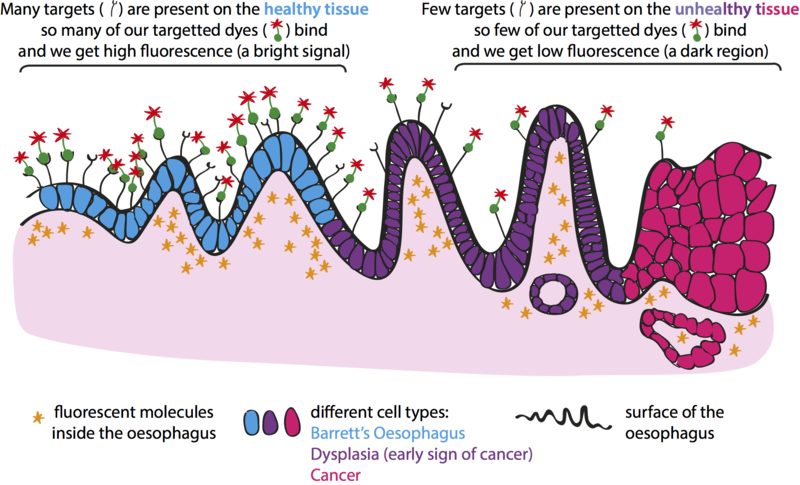 Our recent work focuses on early detection of cancer in the food pipe (the oesophagus). Here, early detection of cancer is made easier by the presence of a pre-cancerous disease: Barrett’s oesophagus. 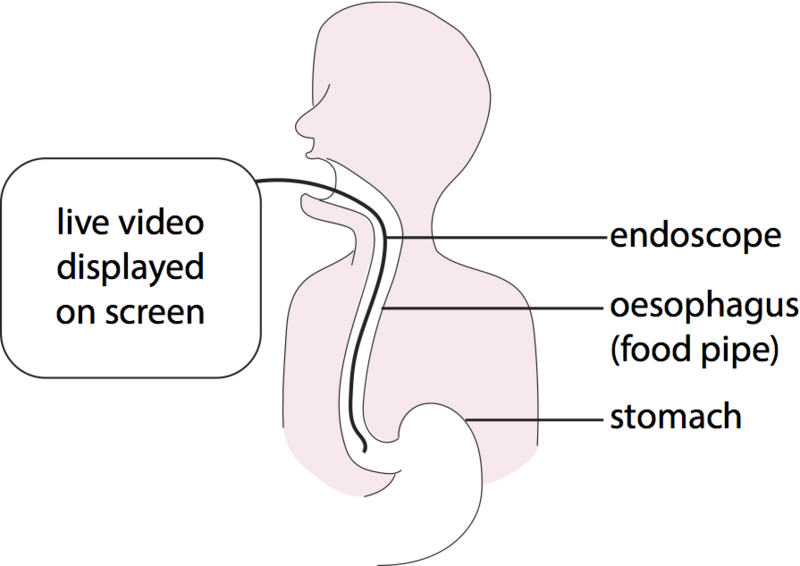 Patients with Barrett’s have an increased risk of developing oesophageal cancer, motivating their close monitoring using endoscopy, a technique which allows us to capture video images of the inside of the oesophagus (Figure 1). Currently, this method uses a normal white light camera – like the one found inside your smartphone – to carefully scrutinise the surface of the oesophagus, searching for the early signs of cancer known as dysplasia. This is challenging; unlike familiar cancers, which form lumps that we can see and feel, dysplastic Barrett’s forms flat patches, sometimes with very little colour change. These are difficult to spot with white light imaging and therefore often evade early detection in spite of regular monitoring. To improve the visibility of dysplasia, we use a dye. When we apply a specific colour of light to this dye, it emits a different colour of light back to the camera (the dye is fluorescent) (Figure 2). When this fluorescent dye is sprayed inside the oesophagus it binds only to healthy tissue, not dysplastic regions – it is ‘targeted’ (Figure 3). The dysplasia should then be clearly revealed as dark patches surrounded by bright signals from normal tissue. However, we had a significant challenge to overcome; the oesophagus itself is fluorescent. It too emits light, even in the dysplastic areas that we were expecting to be dark. So, the difference in brightness between the dysplastic and healthy regions was very low, and the dysplastic regions evaded us once more (Figure 4a). To overcome this problem, we selected a dye that emits a different colour of fluorescence to that of the oesophagus. 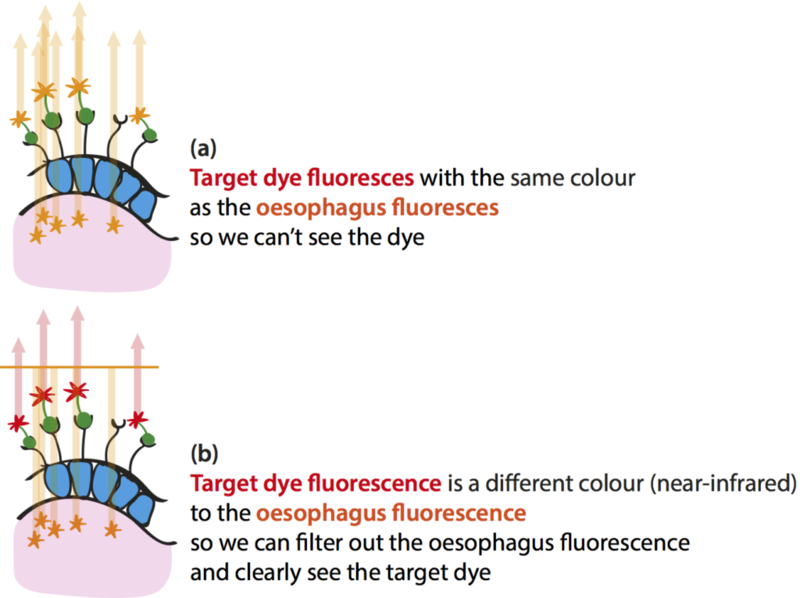 This way, if we look at the particular colour (or ‘channel’) of our targeted dye, we no longer see the fluorescence of the oesophagus, and the dysplastic areas will appear dark again (Figure 4b). The colour we chose for our dye is not one visible to the human eye – it is “near-infrared” – the range of light between familiar red light, such as that from a stoplight, and invisible infrared light, similar to that sent from our remote controls to the television. Figure 4. Why do we measure near-infrared fluorescence? But just developing a dye is only a first step. Since this dye emits infrared light, it is invisible to the endoscopes currently used in hospitals. To capture images of this dye, we require a specialised endoscope that can ‘see’ the near-infrared light. So, we built one. Our paper describes the design, development and testing of such a device. First we describe the design of the device. Second, we present the important characteristics of the device performance. The resolution (the smallest detectable object) and the sensitivity (the smallest detectable amount of dye) are important to help us determine the smallest region of dysplasia we are able to detect. The field of view (the largest object that can be seen in a single image) is important for the surgeon to understand how easy it will be to navigate the whole oesophagus. The power (the amount of light energy emitted from the device) is important to ensure the device is safe. Next, to check that our endoscope accurately captures images of the dye, we took images of the dye sprayed upon human oesophagus specimens and compared these to images captured with a standard large-scale near-infrared camera. The images were similar and provided some biological validation of our system. Finally, these specimens were sent to a pathologist who determined whether each area of the specimen was positive or negative for dysplasia. We compared these regions to our images and found that the positive areas were darker than the negative areas as expected. This suggests our technique is able to accurately detect dysplasia. Further development and safety testing of the device will lead to a clinical trial of this technique in patients to assess whether the application of this targeted dye can improve the efficiency of early detection of oesophageal cancer.